How can a Pakistani and an Indian be friends? International Development students Mehrin Shah and Anushna Jha talk about their friendship which transcends the India-Pakistan border. DISCLAIMER – This piece of writing is about the friendship of two graduate students at the LSE, one from Pakistan and the other from India. If you have time and the inclination to read it and especially if you are an Indian or a Pakistani, please read it with all the love. Thank you! 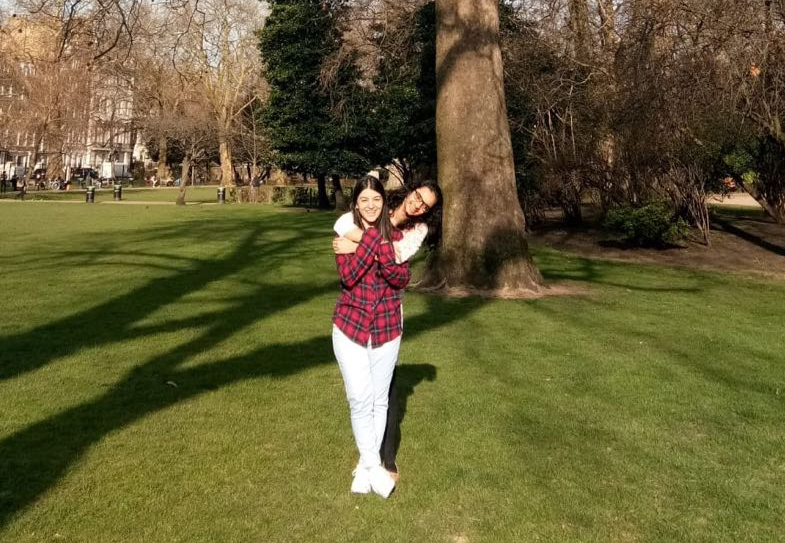 Anushna Jha (India) and Mehrin Shah (Pakistan) are friends who met at LSE. First, Professor James Putzel asked us to write a blog about our friendship. Second, to celebrate the many friendships that Pakistanis and Indians forge. “Aren’t you two supposed to be enemies?” is the most blatant version of how some people around us react when they see us together. The fact that an Indian and a Pakistani can be really good friends was and is still a “pleasant surprise” for many. We first met at the introductory lecture for a course both of us took, when we happened to sit next to each other. Mehrin heard Anushna mention that she is from India. When they were introducing each other, Mehrin promptly asked her to guess where she is from which Anushna refused to! “I can’t make any assumptions” was her reply; her mind telling her – this girl is never going to talk to me again. She is trying to start a conversation and you are ruining it already! After a minute of dilly-dallying, Mehrin revealed that she is from Pakistan — she was just trying to be funny which she is. 😛 The lecture started soon after and nothing but smiles were exchanged. We now laugh at our first interaction which was all about our respective nationalities! What we both smile about is a certain sense of warmth and affinity that we felt almost instantly when we spoke to each other! Countless other interactions were to follow which included going together for Durga Puja festivities, celebrating Holi with sweets (and snow! ), making plans to go to the Jamaat Khana for Navroz. One of our mutual favourites was the day we attended an India-Pakistan dialogue on Kashmir! Almost threatening Mehrin to attend it in the name of spending some time together, we both ended up having a great time there. While speakers engaged in heated conversations on border issues, we exchanged notes on our own understandings and insights about the same. Furthermore, another thing which built up our friendship was DV455 — a course which talked about change and revolutions. Attending morning lectures and seminars of one of our favourite professors together, we were surprised to find striking similarities in social challenges faced by Pakistan and India. One day, we were discussing something, Bollywood perhaps, and the language we were using was Urdu/Hindi — our Professor asked us “ what language is that”? And we told him how Hindi and Urdu are so similar. He further inquired about our nationalities, both of us chuckled and told him our nationalities. What surprised him was the fact that both of us met for the first time at the LSE; he thought we knew each other for long. We were delighted to discover that both share similar research interests. From talking about the education scenes in our countries to whining about a dearth of events on education and development at the LSE to planning to write a joint paper – we are fortunate to have created a space where conversations can range from random dreams to long-held aspirations. What we have learnt from our friendship was that we do not need to turn our differences into sameness to connect with each other. We are both proud of our respective identities and respect each other for that. We are as much eager to give one another a sneak peak into our countries. Mehrin can’t wait to show Anushna her hometown in Pakistan, and Anushna is excited to attend Mehrin’s wedding if that happens, EVER. No kidding! In fact, we have lots of silly conversations to remember about how Mehrin wants Anushna to find her a “groom” from India and Anushna is happy to work on the “mission groom” — thank God it is not a military mission. And Anushna is already looking forward to welcoming Mehrin in India and going around the streets of Delhi enjoying local delicacies! Hope that happens soon! Till then, South Asian political and social discourses continue to unite us and our differences continue to cement our friendship further. Mehrin Shah and Anushna Jha (@anushnajha) are both students in the Department of International Development at the LSE.